The ways of God are often mysterious, bringing about wonderful events through simple human instruments. No one would have predicted that a young girl walking the paths of Emmitsburg, Maryland, on her way to school in the early 1800s, would some day be a means of bringing God’s grace to the people of a far-off northern city. How well God arranged events to make that happen! The McCann family emigrated from Ireland and settled in Emmitsburg, a pretty Maryland village. Around the same time, in 1809, the newly-founded Sisters of Charity of Saint Joseph’s (later called Sisters of Charity) had moved from Baltimore and set up a house in Emmitsburg. Since education was the great need of the time, they started a boarding school for girls under the leadership of Mother Elizabeth Seton. As the school thrived, Elizabeth — who had a great love of the poor — wanted to include village children in her outreach. She opened a free school, to be taught by the Sisters. To this new school came a flock of village children and among them, undoubtedly, was the little Irish girl, Mary Ann McCann. We cannot but wonder whether Mary Ann knew Mother Seton. At any rate, Mary Ann was to later know many things about Mother Seton and to live in the community Mother Seton had founded. In the late 1820’s, Mary Ann chose to enter the Emmitsburg novitiate of the Sisters of Charity. The Sisters there were living the Rule of Saint Vincent de Paul, adapted to American culture and imbued with the gentle spirituality of Elizabeth Seton, who by then had gone home to God. Mary Ann — now known as Sister Basilia — joyfully embraced the hard novitiate training. From what we now know of her, we must conclude that her formation years were lived in faithfulness to the Rule, in strong devotion to the Lord in His Eucharistic presence and in His presence in the poor. The Sisters of Charity were responding to the need in America for more education and to the growing suffering among the poor. There were large numbers of homeless, unwanted children. Little ones must be cared for, nurtured and taught their faith. Sisters opened and staffed orphanages. And so it was that Sister Basilia was missioned first to Philadelphia, and then to New York, to help care for orphaned children. She loved her work, for in her heart she always longed to respond to “the cry of the poor”. As time went on, difficulties arose between the community at Emmitsburg and that in New York. Eventually, the New York group became an independent congregation, and Sisters were required to choose between the Emmitsburg and New York groups. For the sake of the growing ministry in New York, Sister Basilia and many more elected to stay in New York. This was a heartbreaking choice, for Emmitsburg was the cradle of their religious lives — and for Sister Basilia, her family home. After some years, a new and different call for service came from Bishop Walsh in far-off Halifax, Nova Scotia. In 1849, he asked for New York Sisters to come teach Catholic children, many of them Irish immigrants. Here again, we see God’s guiding hand, for it was Basilia who was chosen to lead a small group. It must have seemed to Sister Basilia that they were embarking on a ship to a cold, unknown future. But she was to bring to Halifax a vibrant spirituality which perhaps no one else would have done as well. Large numbers of children enrolled in the school. In a matter of days, orphaned girls were housed in the convent. After school hours, Sisters visited the homes of the destitute. Mass was well attended and the Rosary, scarcely known as a devotion among Halifax Catholics, became a well-beloved prayer in the homes. A Catholic atmosphere, before unknown, was now found in Halifax. 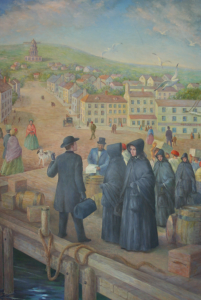 Bishop Walsh, knowing there were religious vocations among Halifax girls, set about helping the Sisters in Halifax become an independent congregation. In 1855, a novitiate opened in Saint Mary’s Convent and Sister Basilia McCann became Mother Basilia. A number of young Halifax girls entered. They learned to live the Rule of Saint Vincent, and they came to love the devotions and practices passed down through the years from Mother Seton. We know those first Halifax Sisters were fervent; it seemed they couldn’t do enough. Though difficult and full of sacrifice, religious life for them was also joyful and made sweet by God’s presence. Even into the 20th Century, some of those early Sisters recorded their memories. They remembered Mother Basilia as a tall woman with dark eyes and olive complexion. She kept the rule perfectly but she also had a warm heart, especially for the young. She often entertained the novices with stories of her early days at Emmitsburg. She laughed with them at their mistakes and misunderstandings. They loved her and strove to imitate her fidelity. They never forgot her. The stories of life at old Saint Mary’s are interesting and full of faith. But that faith was shaken when the news came in 1858 that Mother Basilia was soon to return to her New York congregation. The young Halifax Sisters were to be left on their own – their director, friend and mother was to be taken from them. Of the five New York Sisters then living in Halifax, all left except one: Sister Mary Alexis Mooney spent the rest of her life with the Halifax congregation. Mother Basilia had done much for the Halifax church, but what she had done for the new Halifax congregation can scarcely be measured. As time went on, Sisters she had trained preserved and passed on the charism. New ministries grew and vocations flourished. God had given us a founder to be revered and remembered. She left behind spiritual values which would never be lost. We treasure still the example of her religious commitment, her compassion for the poor, her gift for quietly and simply walking with God.